American Preparatory Academy is committed to helping students become exceptional citizens as well as great scholars. Thus, every student at American Preparatory Academy is a participant in the Character Development Program. This program is an integral part of the daily curriculum and supports the two-fold mission of APA, which is to champion rigorous academic achievement and strong character development. The character development ideals embodied in the Ambassador Program are implemented from Kindergarten through 12th grade. The Ambassador Character Development curriculum is built upon seven areas of focus: social graces, professional behavior, self-management skills, peer leadership experience, community service, civic awareness, and arts/cultural appreciation. These seven focuses are presented and reinforced through a combination of hands-on, high-energy workshops, service projects, leadership experiences, fieldtrips, and culminating activities. The Ambassador program is a school-wide effort. Students and staff are trained to exemplify the skills taught in each area of focus in their daily interactions and to recognize that the application of those skills leads to academic success. 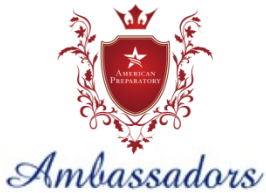 As their character develops and deepens, American Preparatory Academy students become Ambassadors. An Ambassador is a Representative, an Advocate, and a Leader—an individual who naturally puts into action the social and professional protocols taught at American Preparatory Academy everyday. As Representatives, APA students represent themselves and their families. As they progress through their life experiences, they come to realize that they also represent their school, their community, and ultimately the world. They understand that their words and actions unavoidably leave an impression and contribute to the reputation of the institutions and organizations they associate with. Students learn how important it is to represent themselves and others with honor and integrity. As Advocates, APA students have the capability to observe and assess situations, and if necessary, take action to help those in need. An advocate builds communication networks to educate and influence others. They speak clearly and intelligently. They analyze and interpret information, present points of view, and create awareness to bring about change. As Leaders, APA students understand how to open doors of success for themselves and others. They open doors of tolerance by showing empathy and promoting goodwill. They open doors of professionalism by showing commitment and confidence through their actions. They open doors of benevolence by being aware of others’ needs and providing service. They stand for what is right with strong integrity. As students explore these roles through participation in the Ambassador Character Development Program, they are empowered to succeed, not just in school, but in life as well. The information on this website may only be used by American Preparatory Academy employees for American Preparatory Academy students.